If you have gone to the Lama Temple, you should walk across the street where the Temple of Confucius is located: on Guozijian Street inside Anding Gate. The Temple of Confucius in Beijing is the place where people paid homage to Confucius during the Yuan Dynasty (1271-1368), Ming Dynasty (1368-1644) and Qing Dynasty (1644-1911). The Temple of Confucius was initially built in 1302 and additions were made during the Ming and Qing dynasties. It has a total area of 22,000 square meters (5.4 acres). 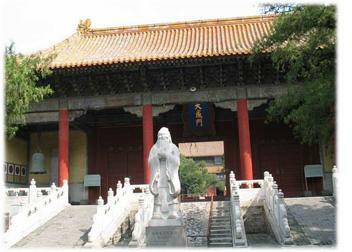 It is the second largest temple constructed for Confucius, the greatest thinker and educationalist in ancient China. There is another 189 stone tables in the northwest of the courtyard where they have all 13 Confucian classics carved into them. The main hall has stimulating exhibits of musical and ritual instruments. In warmer months, art students sketch buildings, trees and scenes in the main court. Since it receives relatively few visitors, the Confucius Temple is one of the rare tourist spots in Beijing where one can spend the day reading in peace, and it’s not uncommon to see locals sitting on the courtyard benches, shooting the breeze.